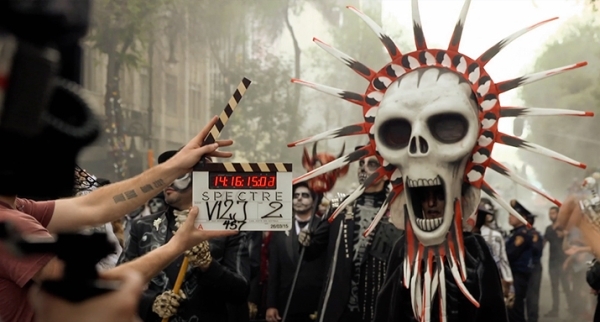 The latest video takes you behind the scenes of the "Day of the Dead" sequence in the latest James Bond movie. James Bond has traveled all over the world, but the films have never been to the exotic land of Mexico. In the latest Spectre video the costume and makeup designers talk about the challenge of making up 800 extras for the crowd scenes without using CGI. Spectre is the twenty-fourth James Bond film. It's the second James Bond film directed by Sam Mendes and Daniel Craig's fourth movie playing James Bond. The villain, Franz Oberhauser, is played by Christopher Waltz and his Dave Bautista plays Mr. Hinx, an assassin and high-ranking member of SPECTRE. Are you looking forward to SPECTRE? How hard would it be for you to dress 800 people in a few hours? 007 really has stood the test of time. I think its great movies are going back to basics with makeup on extras. Real people generate realistic vibes. I'm not sure how widespread the abandonment of CGI has spread but it is interesting. What amazing scenery and costumes. I didn't finish watching the last Bond movie, but I tend to like them. CGI seems to be the reason for some lousy reviews. As I was reading this I kept expecting the Avengers to pop up too. Sorry, I guess the name Spectre just took me there. :) Bond movies are a favorite and the more realistic the better. That big Day of the Dead mask looks kind of like Ghostface from Scream. It will be very nice to watch this scene in the movie, but you know, most of the people and authorities in Mexico were going nuts about the filming and wanted them to get over with it soon. The traffic was absolutely chaotic as it was to get into any of the streets in the nearby area, which is full of stores. I'm so excited about seeing this movie. I am going to miss Craig as Bond. He's been great. I'm also looking forward to seeing the sexiest woman alive as a Bond Girl...Monica Bellucci. It's an amazing spectacle Meradeth and a huge part of Mexican culture so it's exciting to see them embrace Hispanic culture like this. I can't wait to see Spectre, it's got a great cast and awesome director, so I have high hopes for this one and hopefully many more after it.